Textile Toolbox, an 'exhibition of Swedish fashion and textile design instructions from the future', was co-curated by Professor Becky Earley and Dr. Kate Goldsworthy, with Assistant Curator Miriam Ribul. The exhibition featured new work by all the curators and the TED researchers – Professor Kay Politowicz, Melanie Bowles, Kathryn Round, Isabel Dodd, Clara Vuletich, Bridget Harvey, Emmeline Child and Josefin Landalv. As well as the ongoing online showcase for Mistra Future Fashion, there was also a touring exhibition: London, Glasgow, Copenhagen, New York, Borås, Uppsala, Falmouth. 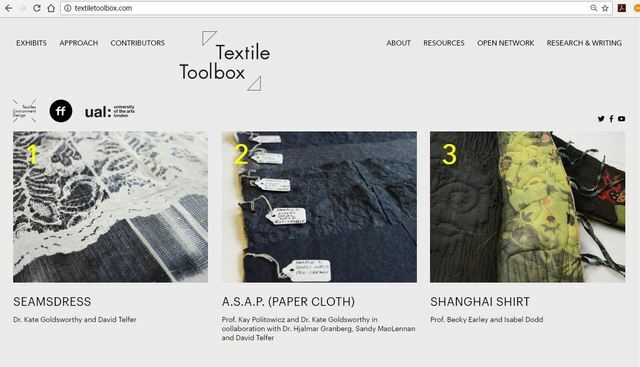 Textile Toolbox is TED’s web platform project for MISTRA Future Fashion. The research consortium aims to create systemic and profitable change within the fashion industry through ‘interconnected design thinking and processes for sustainable textiles and fashion’. This open website is a platform for designers and experts to engage with new design ideas. The first phase of the site (Dec 2012 – Nov 2014) relied on the contribution of a group of experts from different disciplines, chosen by TED. Each section on the site is lead by one or more experts, who contributed with key case studies and interviews with leading industry stakeholders. Together we considered how to lessen impacts, improve function, and make connections. The focus is on inspirational projects and also on the challenges the industry faces in shifting towards systemic industry change. We challenged aesthetics, process, production and lifecycle issues around products. The posts on the site and design briefs generated through research workshops and exchanges formed the basis of the online exhibition – which we launched for the second phase of the site in November 2014. The exhibition proposes how The TEN strategies can translate technical, scientific and behaviour research insights into new design concepts. The resulting products demonstrate the potential for progressing a sustainable fashion system with new materials, processes, applications, consumer interfaces and business models. The exhibits are a starting point for discussion – provocations, or ‘provotypes’ – showing us how design tools can create entirely new visions for the future of the industry.